The Flat Earth community has attracted a following that includes some high-profile adherents. Kyrie Irving, the NBA superstar now a member of the Boston Celtics, is one. Musician Delano Edwards is another. After the SpaceX launch, Edwards slapped together a YouTube video called “FLAT EARTH PROOF (ELON MUSK SPACEX FALCON HEAVY WAS FAKE)!!! !” which poses several questions such as “Where the f*ck the satellites at?” and “Why ain’t it spinnin’?” Then there is this one which absolutely closes the deal: “Where the f*ck the stars at?” It’s hard to argue with thoughtful insights like that. 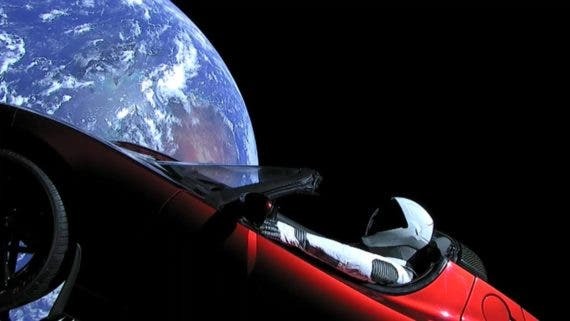 The folks at Vice report that some bright lights of the internet community claim the rocket with the Tesla Roadster inside was a stunt intended to distract attention away from news that Tesla suffered its largest ever quarterly loss at the end of 2017. Others say it’s all part of an evil Illuminati plan. They bolster their belief by claiming they see Illuminati symbols embedded in the photos of the Roadster. Channeling the great “The moon landing was a hoax” conspiracy trope, others allege the entire thing was a CGI script or actually filmed on a back lot at Warner Brothers. For proof, they point out that the footage from inside the space capsule was shot using a fisheye lens. Q.E.D. Talk about your reductio ad absurdum! Not all the diatribes are ridiculous. For instance, there is this one comment that makes some sense: “Why would we believe any privately-held company to report the truth?” Hmm … gotta think some more about that one. Is there a point to all of this? Not unless you want to ponder the implications for society that the internet hath wrought. A comment posted by arne-nl to our recent story about solid-state batteries sums it up nicely. He writes, “The internet has changed the distribution of information from a unidirectional ‘few large generators to many small consumers’ model to a ‘multi-directional many consumers to many consumers’ model.” (Please pardon my minor editing, Arne.) YouTube is at the heart of that revolution and we have recently taken a look at how it distorts information in a way that can do a disservice to the larger community. The other day, we did a story about the Idaho legislature banning discussion of climate change from the science curriculum in its schools. One of the chief sponsors of the bill was a brainiac by the name of Scott Syme who said (with a straight face, apparently), he didn’t care “if the students come up with a conclusion that the earth is flat — as long as it’s their conclusion, not something that’s told to them.” Compare that to the words of Kyrie Irving, who had this to say during an interview. I don’t want to turn what started out being light hearted into something dark and foreboding, but do you see the connection between the words of Kyrie Irving and those of Scott Syme? “Do your own research.” Both are saying “make your own inquiry and whatever you conclude is OK.” Certainly, we don’t want Stepford Citizens who willingly accept what their government tells them to believe. Nor do we want to stifle critical thinking. But this whole “do your own research” idea is troubling. Among other things, it gives cover to the climate denier crowd. Scott Pruitt says he wants an “honest, transparent debate about what we do know and what we don’t know, so the American people can be informed and make decisions on their own.” This is the Fox News fallacy that infected America starting decades ago. Everything is open to debate. There are two sides to every question. There are things called “alternative facts” that people should be aware of. No, actually, there aren’t. The moon really does revolve around the earth. The tides do rise and fall. Stars are not the eyes of our departed loved ones looking down on us from heaven. People can debate whether Salvador Dali was a better painter than Picasso, but the composition of the physical world is not a matter for individuals to speculate about and form their own conclusions. Gravity does not stop being a force just because someone posts a video on YouTube claiming it’s a hoax. You can learn a lot from reading the comments posted here at CleanTechnica. We are blessed with a particularly smart, savvy group of readers. One in particular from exdent 11 about Idaho’s decision to bar discussion of climate change from its science curriculum struck me as being especially pertinent. “We really are only one science-free generation away from the medieval dark ages,” he wrote.